The Cowan Report: Why Would H&F Council Want To Rubbish Shelter’s Housing Benefits Research? Why Would H&F Council Want To Rubbish Shelter’s Housing Benefits Research? 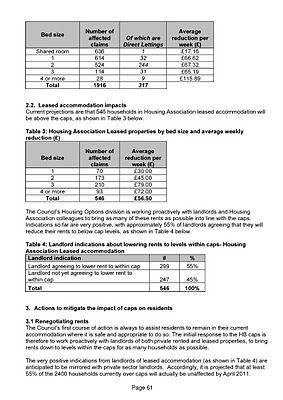 The big question in front of the last Housing Select Committee (see page numbered 57) was what will be the likely consequences of the Government’s housing benefits and Local Housing Allowance cuts for almost 25,000 Hammersmith and Fulham households? We last considered this at a meeting in November when a senior official had advised us that his department did not know whether there will be “a small wave of homelessness applications or a homeless Tsunami.” Clearly, this is an issue H&F Council needed to get on top of. But it hadn’t and last November’s meeting had verged on farce. My Labour colleagues and I had insisted on a more thorough approach and so it was to Cllr. Lucy Ivimy’s (Con) credit that she agreed to my suggestion that we both attend a meeting with Shelter to hear about their comprehensive research on the subject. She is our Borough’s Cabinet Member for Housing. On 18th January 2011 Cllr. Ivimy and I met Shelter’s Rachael Orr and Kate Webb who presented the study Shelter had commissioned from Cambridge University’s Centre for Housing and Planning Research. Rachael and Kate also kindly agreed to give up their time and present Shelter’s findings at the Housing Select Committee on the 15th February. I was therefore concerned to see that the Chair of that Select Committee had decided not to include the Cambridge University research in the Committee papers for that meeting. Instead, and once again, he allowed his committee to be presented only with a flimsy and inadequate paper written solely by H&F Council officials. Indeed, there was no independent information whatsoever despite there being plenty from government and other bodies as the links in this report demonstrate. The Chair then surprised all as the meeting began by admitting he had only “flicked through” CU’s research. The reaction of Nick Johnson, was even more extraordinary. He is the interim housing director/consultant. Following the initial presentation from Shelter’s two policy experts he abruptly announced “I deal in facts. Not predictions!”. Then, with an indignant shrug he folded his arms, leant back in his chair and turned his gaze away from the two women. Rachael and Kate then performed a master class in professionalism. They gave a dispassionate explanation of how the research was undertaken, why it was not a series of “predictions” and how a local authority keen to do all it could to minimise problems for those affected could apply it usefully to their own work. They finished by offering to assist H&F Council officials in any way they could. I asked another official from the housing benefits team if H&F Council had any information that was anything as "thorough" or based on such "robust evidence" as Shelter’s CU report? “No” came the reply. I then questioned Nick Johnson on his highly unusual approach to our guests and the information they had commissioned. “Can we explore your definition of ‘facts’: how many landlords has H&F Council spoken with in each of the different categories listed on page 61?” Mr. Johnson started quoting from his council papers. So I asked again “What ‘factual’ information does this council have about the 1,916 households listed on the graph at the top of page 61 (click to enlarge attached photo) and in particular, not those  households placed into direct lettings by your department?” A few moments passed and then Nick Johnson admitted he didn’t personally have any factual information about this group – which is the largest category of local people finding themselves with shortfalls in the money needed to pay their weekly rents. He asked his colleague for the answer. “We’ve spoken to a handful of landlords in that category councillor.” “A handful?” I asked. 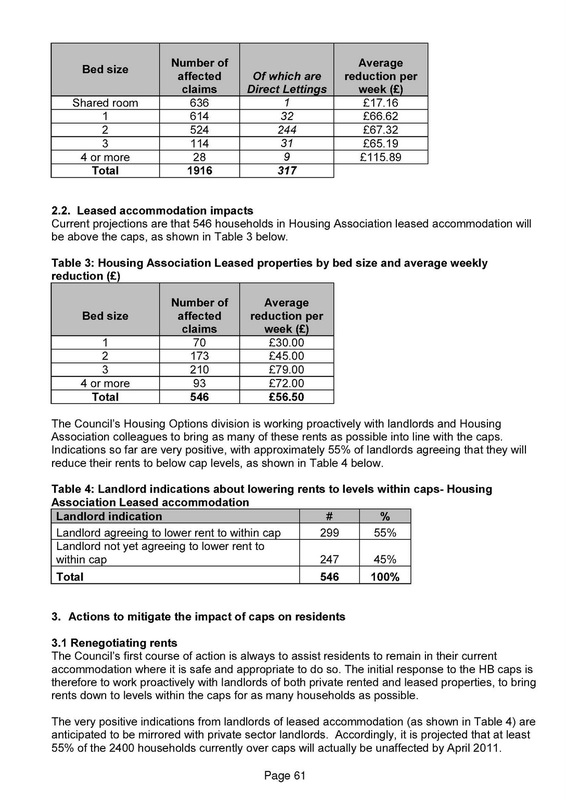 “Yes councillor no more than ten and it’s bad news I’m afraid as they indicated they wouldn’t cut their rents and would look to evict”, he responded.“Ten out of over 1,500 hardly justifies the boast of ‘I deal in facts’ does it?” I asked. Nobody answered. "I did go with Councillor Cowan to see Shelter. I have never been as disappointed and unimpressed in my life. I thought Shelter was a reputable organisation. It presented us with a report based on false assumptions and deeply flawed analysis - coming to alarmist conclusions - coming to alarmist conclusions - yes obviously some 26-year-old undergraduate who had no knowledge or understanding of statistics and had no idea what he was doing. That's who obviously did it." This was followed up with a more restrained attack during which Cllr. Ivimy set out H&F Conservatives' official position about Shelter’s research on their website. The last Housing Select Committee turned out to be a disaster for H&F Conservatives’ official position. Shelter demolished it by doing no more than politely and deftly demonstrating the quality of their research while allowing those present to contrast it with the shoddy information produced by H&F Council. Before the meeting Shelter had responded to Cllr Ivimy's attack saying "We look forward to seeing Hammersmith and Fulham's own independent assessment of the impact these cuts will have on child poverty and homelessness within the borough.” H&F Council proved incapable of presenting any information that came even close to that standard. So, why are H&F’s Conservative Administration taking such little interest in what will happen to the thousands of low-income Borough households who could find themselves homeless? Why did they and the Borough’s senior housing “consultant” pour scorn on the best independent research available? You only have to consider this administration’s wider approach to housing and homelessness to conclude that the answers to those questions are really very alarming - especially if you’re a Hammersmith and Fulham resident who could shortly be threatened with homelessness. Disgusting what the Tories are doing to the homeless. What ever people think of Gareth Mead he would have been very thorough on this matter, his reports were always detailed. He cared passionately for the homeless and boy since he has gone you can really tell the change in tone at LBHF. We still miss him!